We are in the process of establishing a dealer network. If you are interested in selling Googalies in your retail store, online store, or as a vendor at quality live events, please contact us at info@googalies.com, or call our wholesale ordering hot line toll free at 1-888-488-8400. We are committed to leveling the playing field for small businesses and offer creative wholesale pricing that fits the needs of the small business owner. 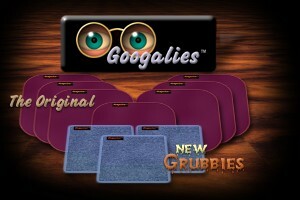 Demonstrating the effectiveness of Googalies to your customers is simple and rewarding. Their cleaning ability, even on heavily grease stained surfaces is simply amazing. We are confident that you'll find this high quality, fast moving product, to be a profitable addition to your inventory. We honor Mastercard, Visa and American Express for wholesale orders. If you need more information please contact us at info@googalies.com or call us at (541) 488-8325.